What dates would you be looking for? Buenas Tardes Olga, Sera un placer asisterle con la informacion que requiere. Por favor contacteme a mi linea directa 786-870-2947 o envieme un correo a maria@travelparatodos.com. Gracias. Maria Bello - Travel Para Todos LLC. I use a very affordable and reliable transfer company for all of my clients called USA. If you go to my website www.shoreluvtravel.com and click on the tab that says more...and then transfer and excursion information. From there you can book your RT Nonstop private transfers! Depending on where you are staying, you may want to reach out to your hotel or resort first. Most offer transfers to their guests. If not, try Lomas Travel http://www.lomastravel.com/transfers.html . Lomas Travel is our prefered transfer service. They have an app called Lomas Angel. I use Amstar Services and sometimes the local taxis. They are safe and inexpensive if you are not opposed to using them. Let me know if I can be of assistance. I agree Lomas is the best! AMStar DMC has a great agent rate. There are Nexus and Lomas also. Nexus does not have an agent rate. Viator contracts with transfer companies. You get the better price direct with the company. I have used Lomas. Based in Mexico they know the area. I have used the same transfer and private tour company for over 15 years... email Julian at oszicancun@hotmail.com , professional excellent and amazing personal service. Excellent prices! What's the best season for whale sharks? Hi Greg, Whale shark season is May through September but mostly from July and August. Have a great afternoon. Best time is now...try going to Isla Holbox, they specialize in these tours. Excellent boutique hotels to stay in right on the beach...priceless.....no mode of transport except golfcarts...restaurants amazing and fresh! I need some person to find me a room to rent for a week and to pick me up at the airport and maybe show me around. I am interested in moving to Cancun. Thank you for your advice regarding the Service Dog Central site, I am still concerned about how accessible Mexican stores and restaurants may be for me. In Canada, by law, the service dog is allowed anywhere I am. Additionally, is it fact or a myth that a person should not drink the water? Should my dog only be given bottled water? I am sorry that I can only read English, those replies in Spanish, I cannot read. Thank you, I have checked this site and it does not mention anything about the "importation of live animals"
Hi Beverly, From what I've been reading and what some of my Mexican hospitality contacts have been telling me...Mexico is not a very dog friendly country. Canadian and US service dog laws do not apply in Mexico and they do not have their own laws around service dogs. I would contact your hotel/resort to get their take on it. They may know of some pet-friendly restaurants and stores. You may also need to travel by taxi everywhere as I hear dogs are not allowed on public transportation as well. 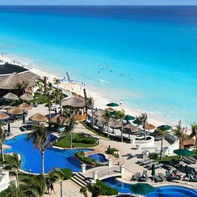 As far as the water, most higher-end resorts in Cancun/Mexico have filtration systems, however it is still not recommended that the water be consumed from the tap. You AND your dog should only drink bottled water to air on the side of caution. Catching a nasty bug or bacteria could be life-threatening to your dog, especially if caught internationally where your vet is not within arms length. I hope that helps! Hi Beverly, This advice from Amber is exactly what I would have written you. I would contact your hotel or resort and see what they advise you, as far as pet-friendly options to take your service dog. I also agree with you needing to take a taxi, as pubic transportation will not allow you to take your dog and also would advise the same on drinking bottled water for both you and your dog. Better safe than sorry. Good luck and safe travels! I have a service dog for balance and anxiety, she is certified, vaccinated and has a clean bill of health. What are the Mexican rules concerning access with service dogs? Please contact me at crystal@paradiseweddingsandtravel.com if you need any assistance booking your trip! In order to bring a pet (dogs and cats) into Mexico, the following documents must be presented at the Office of Animal Health Inspection (OISA) at international airports and ports of entry into Mexico: If the pet is 3 months old or less a "Certificate of Good Health" issued by an official authority or by a licensed vet must be provided with his or her signature is approved in the United Kingdom and has to be issued no more than 5 days before the animal enters Mexico. If the pet is older than 3 months, the "Certificate of Good Health" must also states immunizations against rabies, distemper, hepatitis and leptospirosis. Any immunization must been administered at least 15 days before pet's arrival to Mexico, but no more than one year. The pet will be physically checked by the OISA and that office will determine if the animal is allowed immediate entry or must remain in custody for an additional inspection. In the first case, it will be issued a zoo-sanitary importation certificate, which must be carry when leaving Mexico. In the second case, If the above said authorities retain the animal, they should also give you a voucher. - quoted content from the Mexican Consul official site regarding animal importation In order to bring a pet (dogs and cats) into Mexico, the following documents must be presented at the Office of Animal Health Inspection (OISA) at international airports and ports of entry into Mexico : If the pet is less than tree months, a "Certificate of Good Health" issued by an official authority or by a licensed veterinarian provided that his or her signature is approved in the United Kingdom and issued not more than five days before the animal enters Mexico If the pet is older than three moths, the "Certificate of Good Health" must also states immunizations against rabies, distemper, hepatitis and leptospirosis. Any immunization must been administered at least 15 days before pet's arrival to Mexico, but not more than one year. At the OISA your pet will be physically checked and that office will determine if the animal is allowed immediate entry or must remain in custody for an additional inspection. In the first case, it will be issued a zoo-sanitary importation certificate, which must be carry when leaving Mexico. In the second case, If the above said authorities retain the animal, they should also give you a voucher. If your pet is coming from a country where foot-and-month disease or risk of that disease exists, it must receive a prophylactic treatment. --------------------- (http://portal.sre.gob.mx/conreinounido/index.php?option=displaypage&Item...) They make no special provision for if the animal is a service animal. So for the purposes of travel, he must meet the pet requirements above. To return to the US, you will need a current rabies certificate that lists the name of the rabies vaccine used, lot number, and date of injection. http://www.cdc.gov/animalimportation/dogs.html (requirements to return to the US) Be aware that Mexico is not bound by the Air Carrier Access Act. They can require that your dog enter their country in cargo. Some countries do that. The airline will know if this is the case. Probably not, ie probably he can fly in cabin, but be prepared that this is a possibility. You should contact the Consul office to learn about any laws regarding public access with service animals while in Mexico. Most countries do not recognize the range of service animals that the US does. Some recognize only guide dogs, and some none at all. I'm guessing that Mexico will be fairly similar to the US in this respect, but you can't count on it, so ask. An International Certificate of Good Health (Form 77-043) issued by a licensed veterinarian (signature must be approved by the State Veterinarian) who has examined your pet and... Proof of vaccination against rabies and distemper, administered at least 15 days before your pet enters Mexico. this is helpful, I will contact my vet to make sure my dog has had all of these vaccinations. Do I need a form from the department of agriculture "import of live animals"? I had to fill one of those out for the Bahamas. Sr. Mario, hace unos anos que visite a cancun pero por lo que yo recuerdo no habia representantes de los hoteles en el aeropuerto para ayudarles a encontrar un hotel. Creo que su mejor opcion es tener su habitacion antes que lleguen para evitar problemas. Encontre este informacion de los requisitos en la pagina de SEGOB (http://www.inm.gob.mx/index.php/page/Paises_No_Visa): Las personas nacionales de los siguientes países o regiones no requieren visa para viajar a México y solicitar su internación como Visitante sin permiso para realizar actividades remuneradas. En el filtro de revisión migratoria, deberán presentar: Pasaporte o documento de identidad y viaje vigente que sea válido conforme al derecho internacional. FMM debidamente llenada. La autoridad migratoria podrá solicitar a la persona extranjera que compruebe el motivo de su viaje, mediante alguno de los siguientes documentos: a) Reservación de hotel, boletos de regreso (itinerario), boletos de tours (itinerario). b) Carta mandato en idioma español de la empresa matriz, filial o subsidiaria extranjera que indique que la persona extranjera es empleada de ella y que el pago de los servicios que prestará en el territorio nacional correrán por cuenta de la misma. c) Copia del contrato de transferencia de tecnología, patentes y marcas, de compraventa de maquinaria y equipo, de capacitación técnica de personal, o de cualquier otro relacionado con el proceso de producción de una empresa establecida en México o que vinculen a la parte extranjera con la parte mexicana, o constancia de nombramiento por la asamblea de accionistas de empresas legalmente establecidas en México. d) Carta de organización o institución pública o privada en la que invite a la persona extranjera para participar en alguna actividad no remunerada en territorio nacional, manifieste el objeto de la visita y el tiempo estimado de estancia. En caso de que la organización o institución sufrague los gastos de viaje y permanencia de la persona extranjera en el territorio nacional, se deberá adjuntar carta responsiva. e) Carta de invitación o de aceptación de alguna institución perteneciente al Sistema Educativo Nacional para realizar cursos, estudios o proyectos de investigación o de formación por una temporalidad máxima de ciento ochenta días. Buongiorno Mario, Tu puedes ir en Mexico con passaportas del Italia, y tambien Colombia, sin visas. Generalemente, se falten aber 6 meses despues su viaje, que estan siempre valido. En ogni albergho, tu poi pagar con pesos mexicanos che puede comprar al aeropuerto o anche en un banc dove vive en italia o colombia. Los tarjetas de credito son recibido quando presentado con la passaporta. Ho dimenticato si hai una oficina per fare la reservazion del alberghi. Es sembre melio di fare prima di andare si es en il invierno! Grazia per la chanza di practicare italiano y spagnolo anche. Ciao, y buon viaje.